Anyone who has been on a Broadwalk knows there is way too little space here to recount all the joys of learning and doing that Broads pack into their long weekends. But, here are some highlights from my experience of the 4-day Montana Broadwalk in mid-August, based at the Yellowstone Alliance Adventures camp just south of Bozeman. Our first night, the power of nature made real in a torrential rain could not compete with the power of two voices for wilderness who shared their stories under a much-appreciated metal roof. Activist Joe Gutkoski of Montanans for Gallatin Wilderness, an inspiring 89 years young, has worked for wilderness for many decades and reminded us that it’s worth the long fight, and fatigue is not an acceptable option to setbacks. Louisa Wilcox, fiery wildlife advocate and grizzly bear guru, held us spellbound with her inspiring folkloric stories. The passion that manifests itself in the indomitable spirits of wilderness advocates such as these reminds us that fervor drives us to protect the places we love. On Friday we gave a young, tall, and handsome wilderness ranger, Todd Burritt a little lesson in Broadpower. Picking up our tools, we got to work on the Lava Lake trail, from trailhead to lake destination. By the time we finished, people could see the once-camouflaged trail sign from the parking lot, enjoy a vegetation- and litter-free trail, and camp in a clean spot near the lake sans the scars of previous campfires. Turns out, Broadpower was broadcast to a larger audience by Brett French writing for the Billings Gazette. Check out this link for a great story. That evening, we enjoyed happy hour and an informative group discussion with Mary Erickson, Gallatin National Forest Supervisor. Following dinner, Barb Cestero, Montana Director of the Greater Yellowstone Coalition, explained the important values of the Gallatin Range and her staff’s efforts to gain protection for the Hyalite-Porcupine-Buffalo Horn Wilderness Study Area (HPBH WSA). Patti Steinmuller, Montana Wilderness Association board member, told us about the Gallatin Community Collaborative’s efforts to bring together diverse stakeholders to discuss desires and seek agreement for the future of the Gallatin. This has been a contentious effort, requiring the group to work with a facilitator. One very tough issue is how to address the mountain biking and ATV use that has been allowed to continue in the Wilderness Study Area. It’s not clear what this group will be able to accomplish, especially once they get past procedural tasks and turn to the maps and the thorny issues of competing uses. Disappointingly, the conversation among those working for protection seems to be dominated by recreational desires with less emphasis on the essential issue of maintaining this wild ecosystem for non humans. We split into three groups so everyone could find their own level of recreation. The group choosing to hike to Windy Pass with local conservationist Shari Sutherland found both challenge and beauty. The wildflowers were stunning, but not as striking as watching a 60-foot tree burst into flames about 500 yards from the pass! Some of us (well, maybe I was the only one) panicked, and I called 911. But more educated heads prevailed. Given the recent rain and the isolated island of trees where the fire burned in the high meadow, there was no real danger. Still, one savvy Broad recruited a crew of three to put it out. With a little fuel removal and dirt ferried in lunch dishes, the fire died down. As we hiked back down to the trailhead, we met a wildland fire crew responding to our call and told them they need only mop up after the Broads fire crew. They were impressed— young men meet undaunted Broads at work! Saturday night Holly Hill, Coordinator for the Wilderness and Recreation Partnership, helped us understand the challenging issues with mountain bikes and wilderness designation in the Gallatin, especially in the areas adjacent to the booming town of Bozeman. Mechanized transport is specifically prohibited by the Wilderness Act, but mountain biking is very popular in this area among people who also love wilderness. It’s become an area for cooperation as well as contention. As Broads newest board member and passionate wilderness fan, I gave a slide presentation on a wilderness movie project that I’m working on with Denver filmmaker Jim Havey. This film will bring together spiritual, ethical, legal, historical, biological, and economic arguments for wilderness designation into one integrated whole. Sunday – Hiking and More! Patti Steinmuller, Friday evening’s speaker, led a small group to Garnet Peak. With almost 2,800 feet elevation gain in a little over four miles, we were rewarded with 360-degree views near a lookout cabin now available for overnight stays. Others joined writer and naturalist Carolyn Hopper for a stroll through the Hyalite Lake Region, learning about (and tasting) plants along the way, while another group went with Kathryn Qanna Yahu, activist and creator of Enhancing Montana’s Wildlife Habitat website, for an easy hike along the South Fork of Spanish Creek in the Lee Metcalf Wilderness. Sunday evening, Doug Smith, leader of the Yellowstone Gray Wolf Restoration Project and author of Decade of the Wolf, showed us stunning slides and told impassioned stories about the battle to save these magnificent creatures in Yellowstone National Park just south and adjacent to the Gallatins. The power of Aldo Leopold’s described “green fire” lives in Doug and his very being embodies that spirit. …Nancy Ostlie, volunteer leader for the Bozeman Broadband, was indispensable in crafting this Broadwalk experience. She is actively involved with Montanans for Gallatin Wilderness and the Gallatin Community Collaborative and will, with others, ensure wilderness values and protection will not be lost in the movement towards a consensus vision for the future of the Gallatins. Sometimes in the jam-packed days a Broadwalk can seem like too much. But then it’s over, and you hunger for more. When’s the next one? 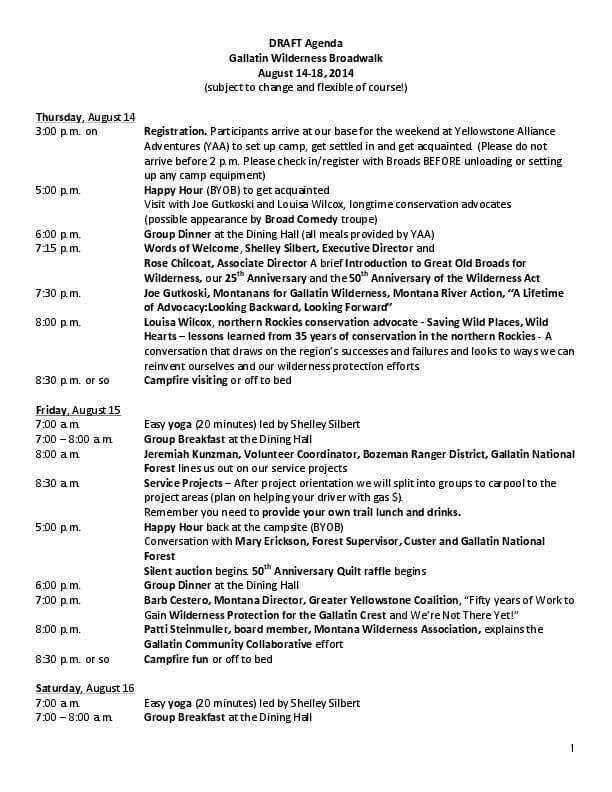 Here’s an agenda for the Gallatin Broadwalk.